Do you like Villains and an edgier side of Halloween? 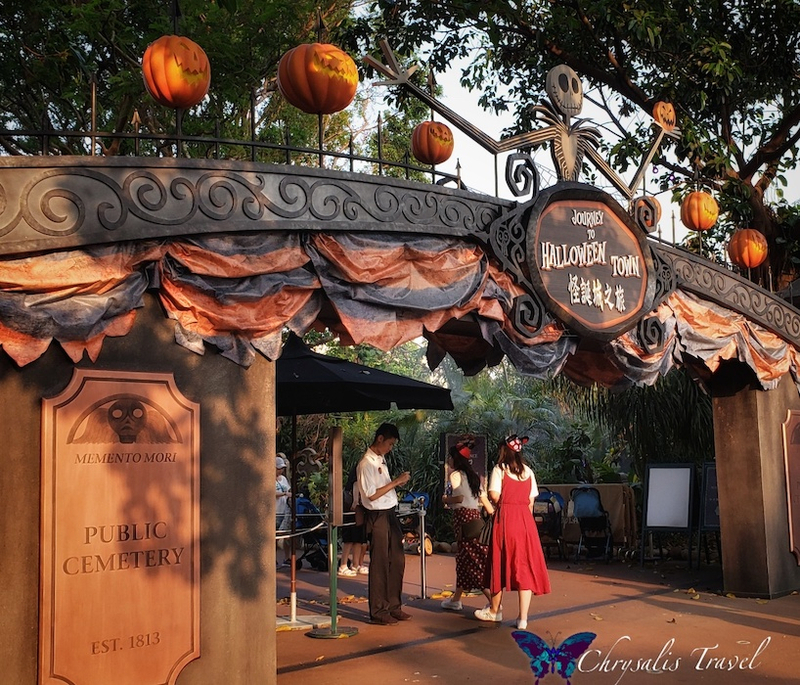 Perhaps an immersive Halloween walk-through attraction, Trick-or-Treating, two Halloween parades, and festive foods? 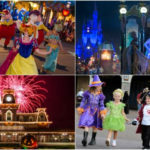 Then you’ll want to consider visiting Hong Kong Disneyland next Halloween. 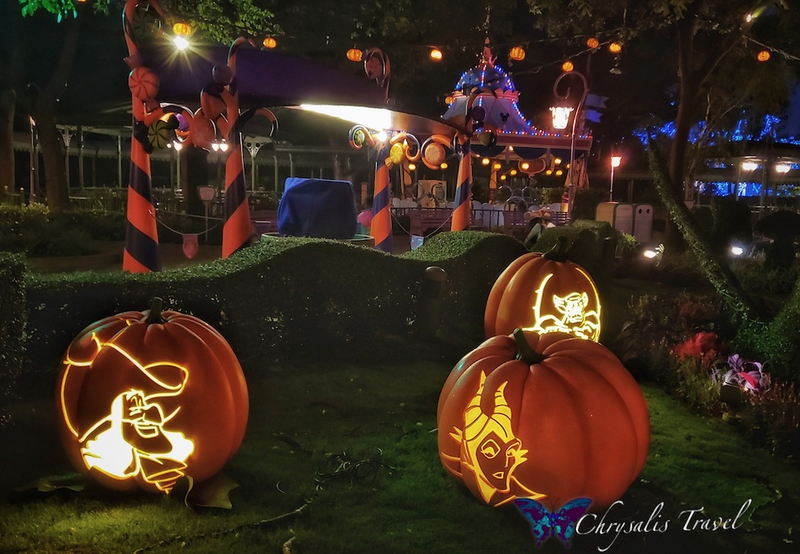 While Hong Kong Disneyland (HKDL) is the smallest Asian Disney Park, it is certainly not a lightweight when it comes to Halloween. 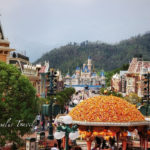 What HKDL lacks in size it makes up for in unique attractions like Mystic Manor, and a darker spin on Halloween that is unlike any other Disney Park. 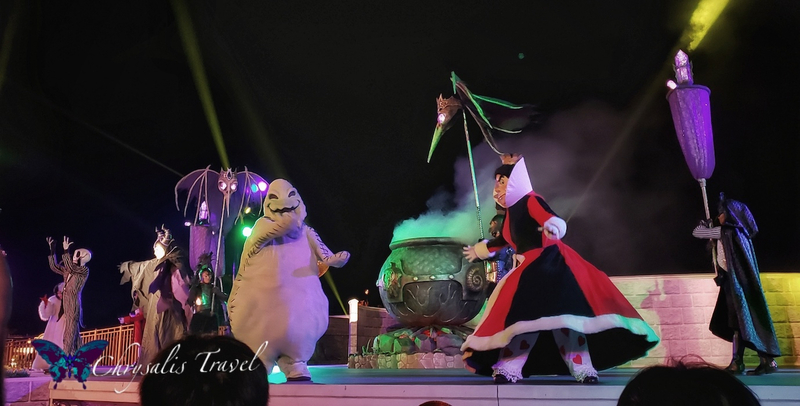 Keeping in tradition with the other Asian Disney Parks, Halloween festivities are available to all Hong Kong Disneyland guests at no additional charge. 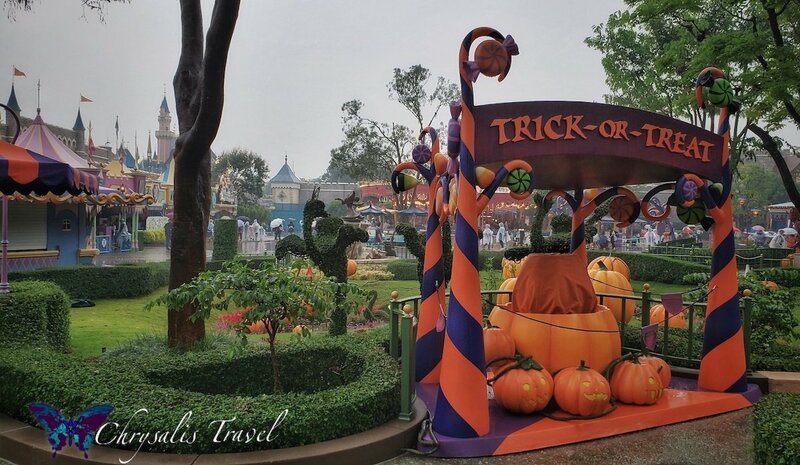 A 2-day “Tourist” ticket to HKDL runs about $89 USD: less than the price of a Not-So-Scary Halloween party. 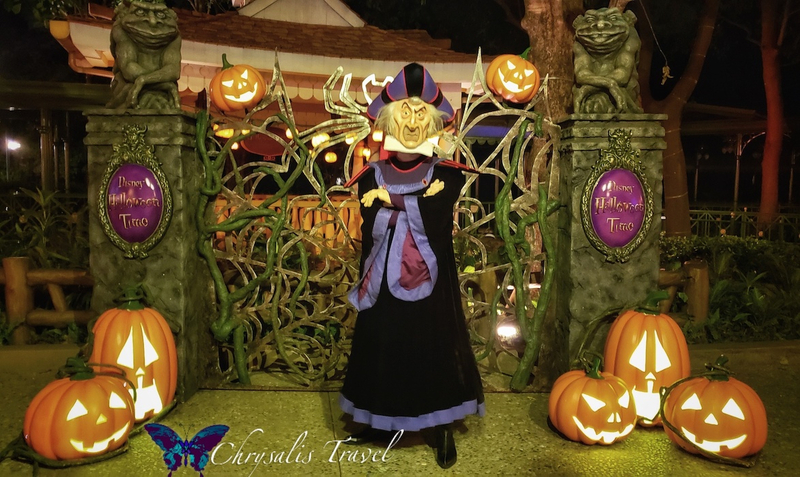 Hong Kong Disneyland is known for embracing a darker shade of Halloween than any other Disney Park. 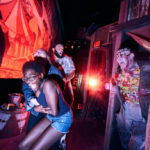 In years past, themes such as “Haunted Halloween” featured grim, not-so-grinning ghosts and true haunted house walk throughs. We’ve even heard of beheadings by the Headless Horseman. 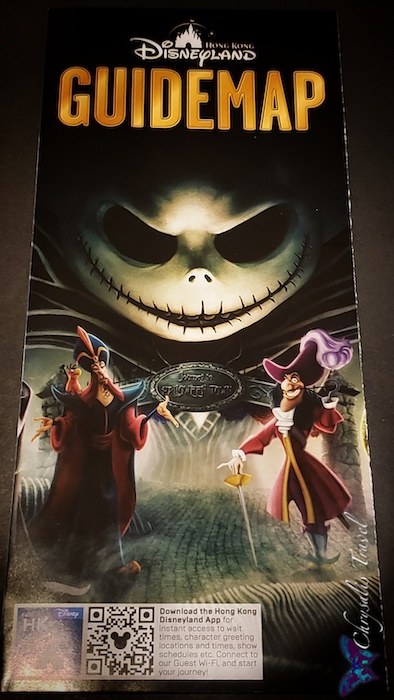 This year’s HKDL map features a sinister Jack Skellington with villains Jafar and Captain Hook on the cover. 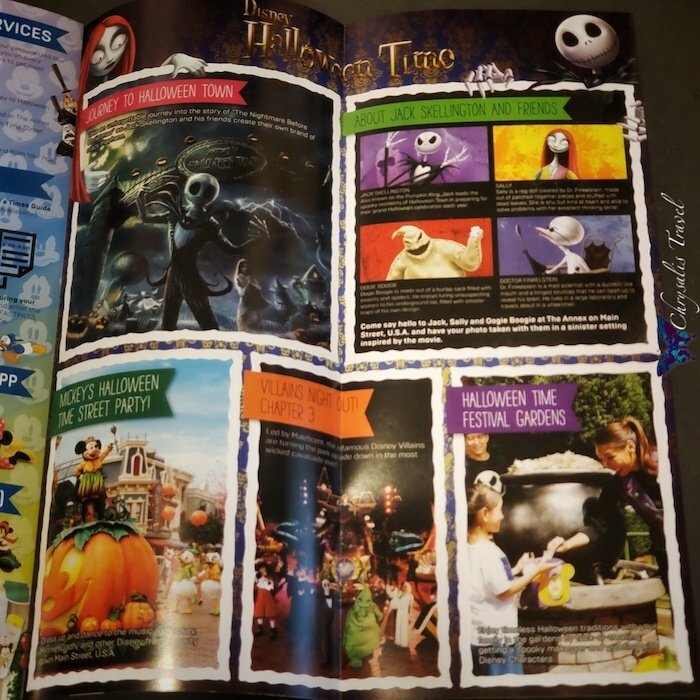 Inside the Park map are special features of “Disney Halloween Time.” The haunted house walkthrough is themed to The Nightmare Before Christmas, celebrating the 25th year of the Pumpkin King himself. “Villains Night Out! 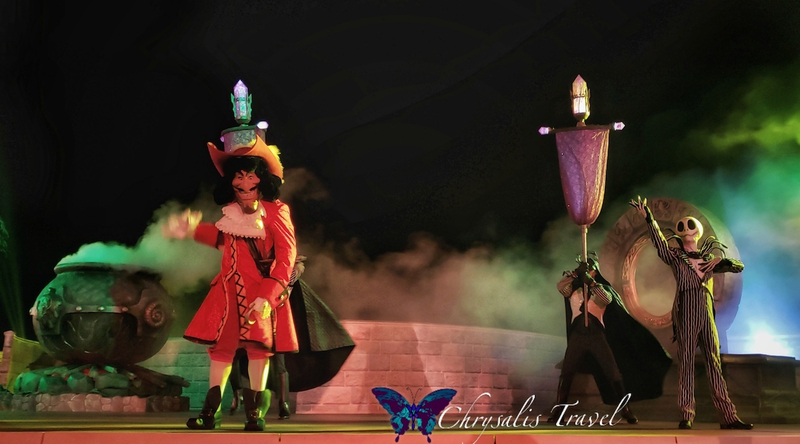 Chapter 3” is the evening parade featuring your favorite Disney Villains. 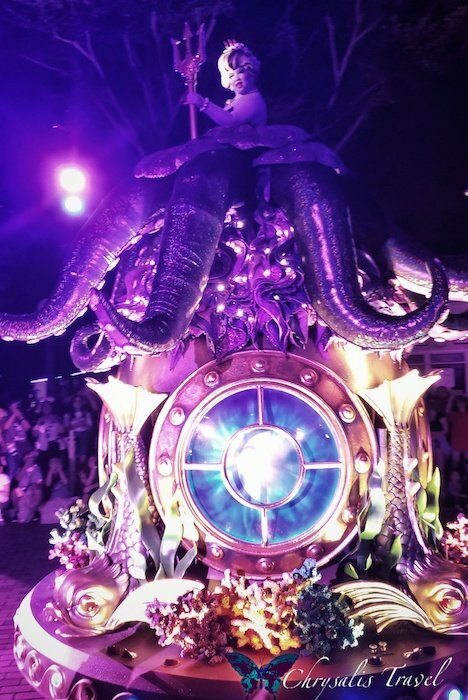 The Halloween décor at Hong Kong Disneyland was festive with a side of ominous. Villain pumpkins illuminated the Festival Gardens after dark. 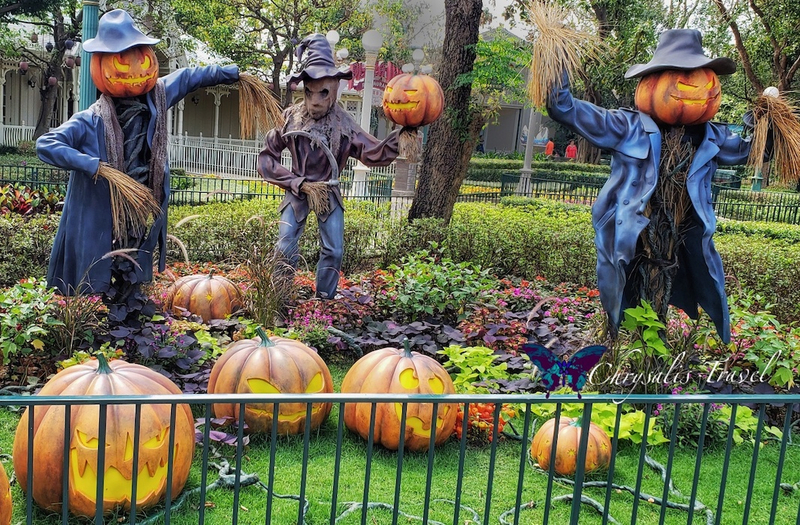 The scarecrow with a scythe near the hub is just a hint of how HKDL’s Halloween is not your typical Disney party. While Toy Story Land is new to Disney World, it’s not new to international Disney Parks. 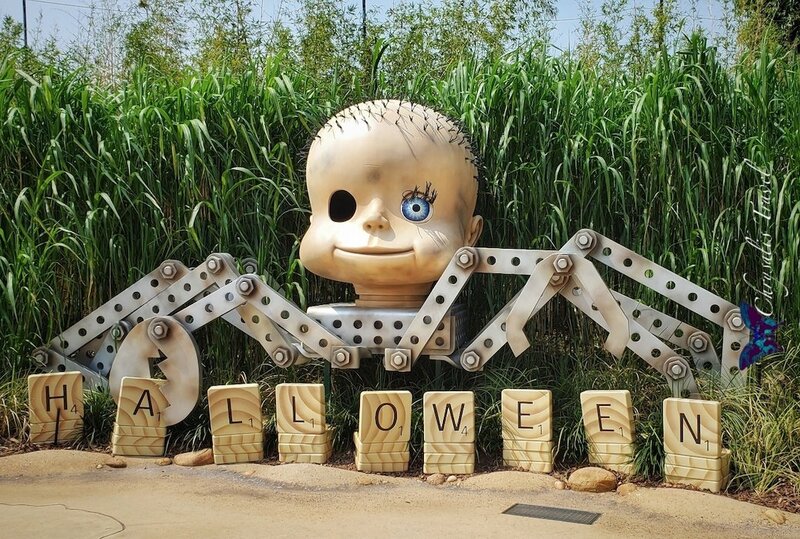 This is the first time we’ve seen Babyface – one of Sid’s toys from Toy Story – as he decorates for Halloween. Oogie Boogie was ready to roll the dice at the end of the night. 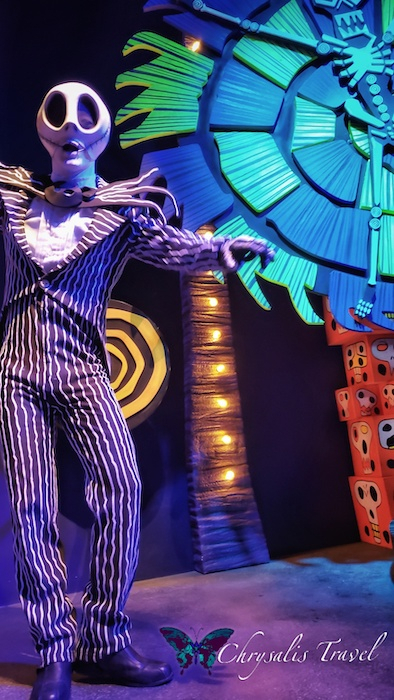 Celebrating the 25th Anniversary of The Nightmare Before Christmas, Hong Kong Disneyland let Jack Skellington deck the halls of this year’s walk-through attraction. 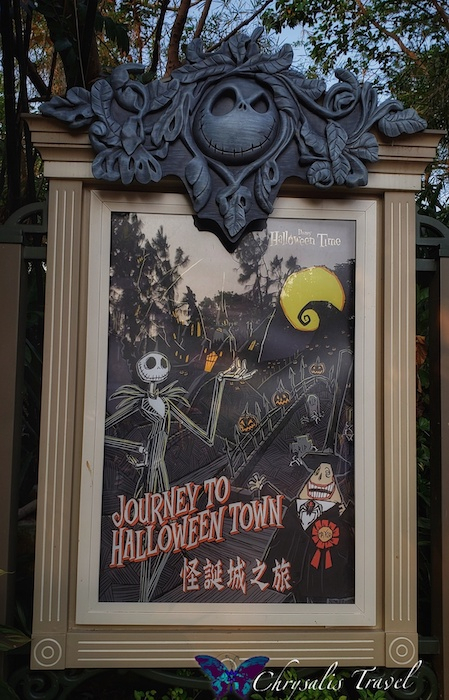 “Journey to the Halloween Town” had its own dedicated entry on the way to Grizzly Gulch. 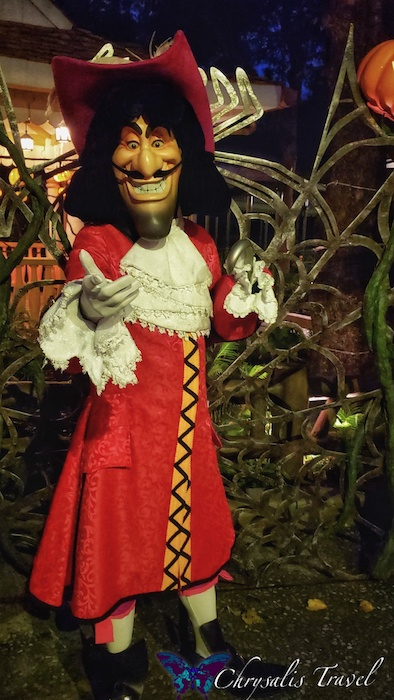 Traditionally, HKDL has added a higher degree of fright to their Halloween walk-throughs. There is even a (!) warning on the guide map that this attraction may be frightening for children. 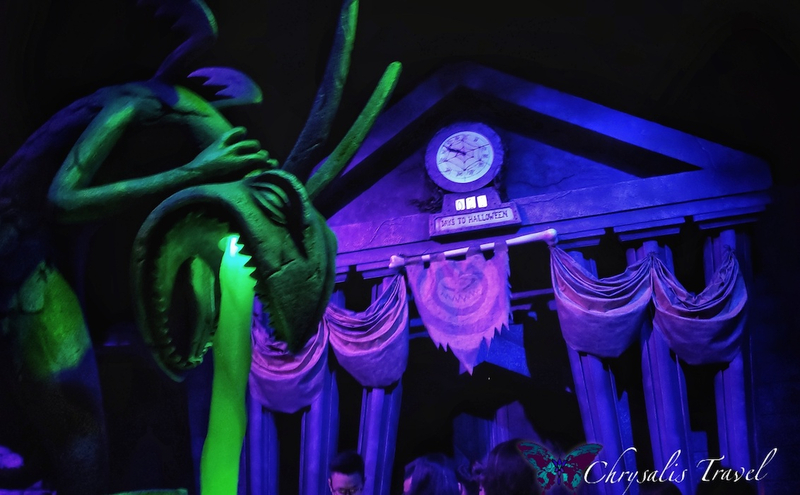 Cast members dressed as grave diggers wander through the queue, dragging shovels and measuring guests for coffins and gravestones. 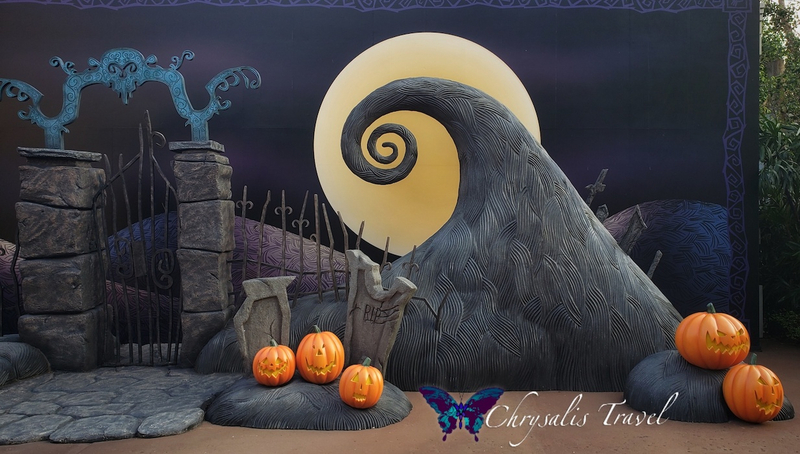 Here is a Halloween Town backdrop perfect for selfies. 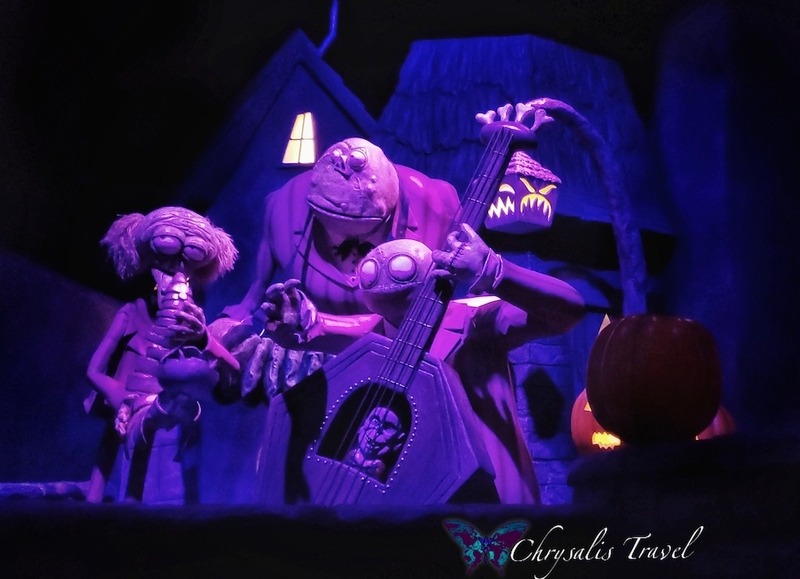 After a long dark hallway, we were serenaded by this band as we entered Halloween Town. The Mayor drove up alongside and spoke to guests in Cantonese. His face alternated between his ‘happy face’ to his ‘sad face’ in the projected animations. 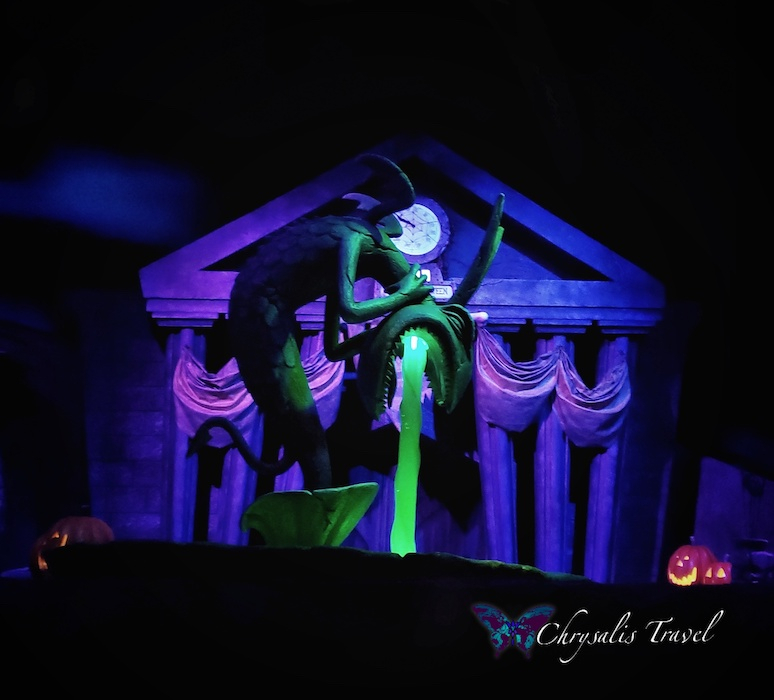 The centerpiece of Halloween Town is City Hall, complete with its unique fountain. In one room, Sally (speaking in English) enlists guests’ help with ingredients for her latest potion for Dr. Finkelstein. We meet Jack inside City Hall (speaking in Cantonese) along with an animated Zero. Then, the path takes us past vampires into the holiday forest with trees decorated for Easter, Thanksgiving, Christmas and Halloween. Lock, Shock, and Barrel have captured a cast member, holding her hostage in a cage. 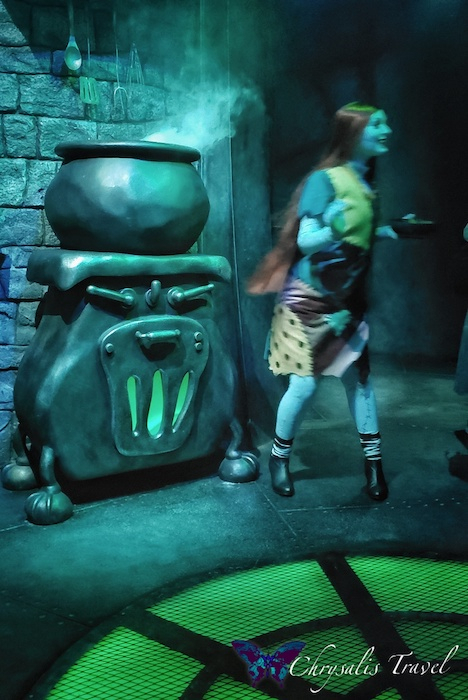 She is sent to the next room (and we follow) … it is Oogie Boogie’s lair. 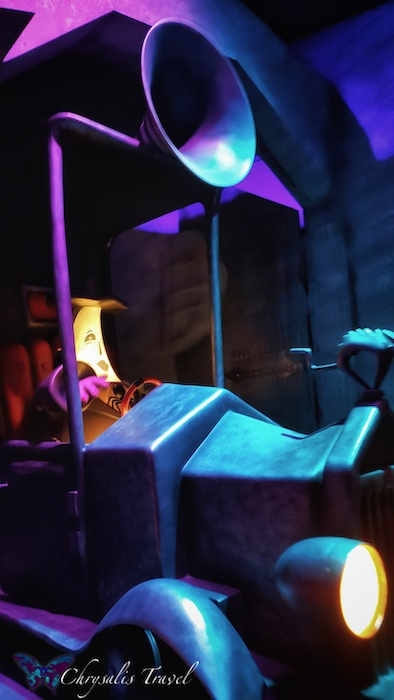 Jack confronts Oogie Boogie and frees the hostage. 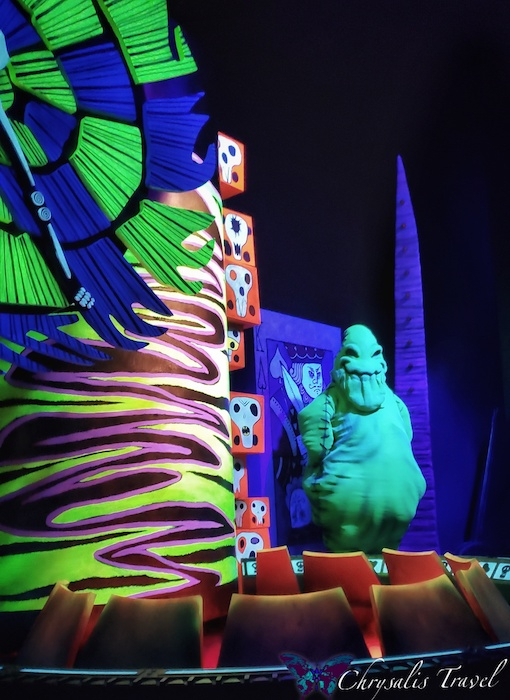 Oogie Boogie is defeated at his own game, and we escape his lair, thanks to Jack. 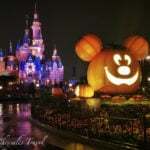 This was our first Halloween at Hong Kong Disneyland. From the reports of previous haunted houses, this was rather tame on the fright meter…but sure to please Nightmare Before Christmas fans. When the sun sets, it’s time for Disney’s Villains to wreak a little havoc. 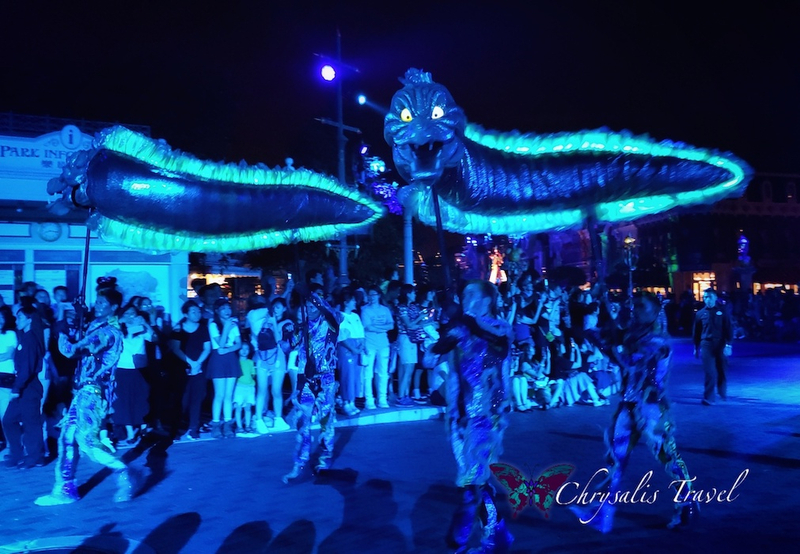 The evening Halloween parade, entitled “Villains Night Out! Chapter 3,” closed out the Park at 8 pm. 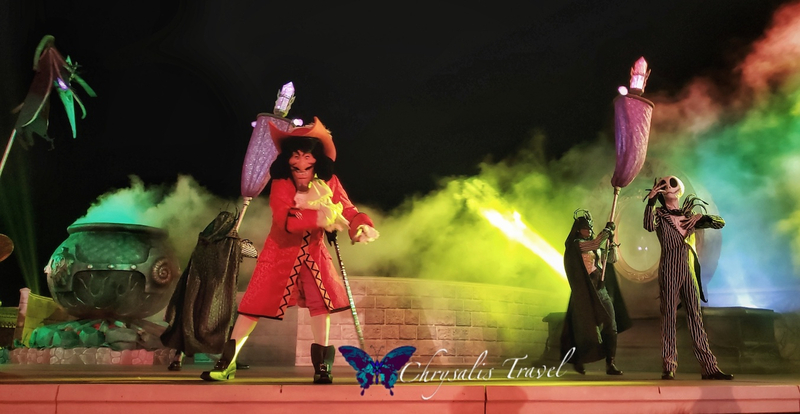 the Queen of Hearts, Oogie Boogie, Maleficent, Cruella, and Frollo. The soundtrack was upbeat, stating the obvious: “Halloween’s our favorite fright night!” Villains floats followed. 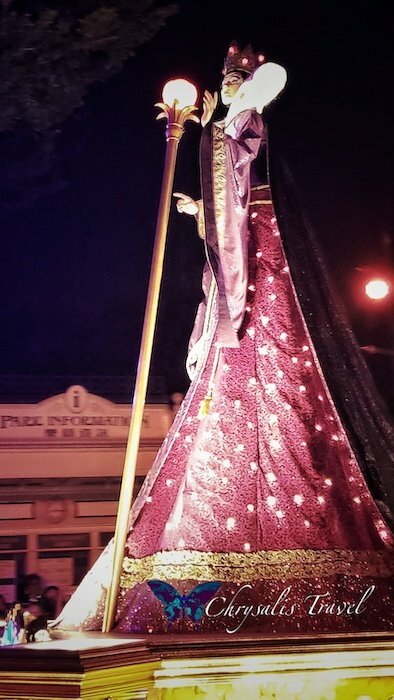 Evil Queen led the way in stately elegance. as they led the way for Ursula. 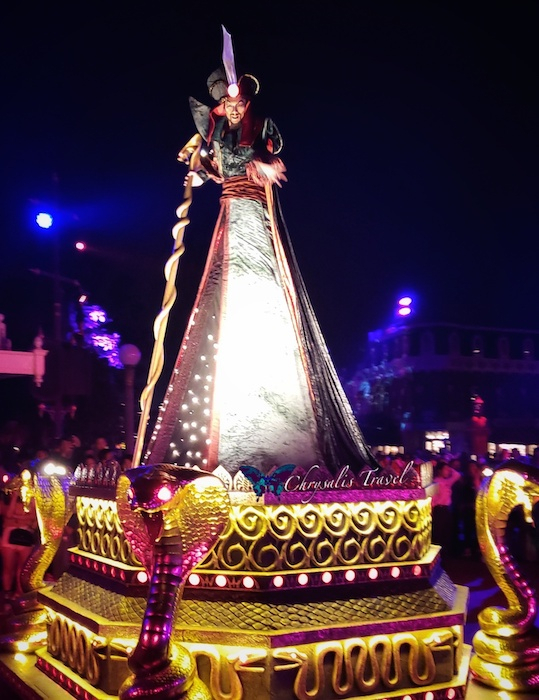 Iago and Jafar wrapped up the parade for the night. 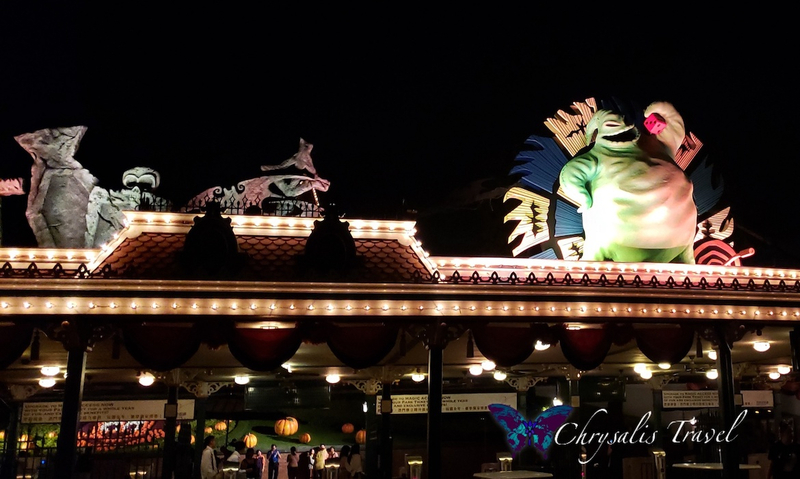 The Festival Gardens in Fantasyland were well themed for Halloween. Here – before 6 pm and when it was not raining – guests can pick up Mickey-themed boxes and collect candy from these Trick-or-Treat stations. and the infamous Captain Hook. The Queen of Hearts also made an appearance. After a long day at the Park, dinner calls. The food at Hong Kong Disneyland was good, with buffeteria-style quick service menus. Some restaurants – such as the Explorer’s Club in Mystic Point and the Royal Banquet Hall in Fantasyland – had several kitchens to choose from. Overall, HKDL did not have as many seasonal foods on the menu as at Tokyo Disney Resort. We saw this cute Mickey sipper and couldn’t resist. It was filled with a special flavored soda and small Jell-O chunks. We also ordered this unique Halloween dessert. It was filled with a sweet pumpkin soup-like concoction. The bats were made from beets and carrots. And the mini pumpkin? It wasn’t a cake, it was really a pumpkin. Inside, it had the texture of spaghetti squash. A tasty but very unusual dessert. Food carts also sold these ‘egg puff’ waffle ice cream cones. The Halloween version appeared to be black sesame flavored. 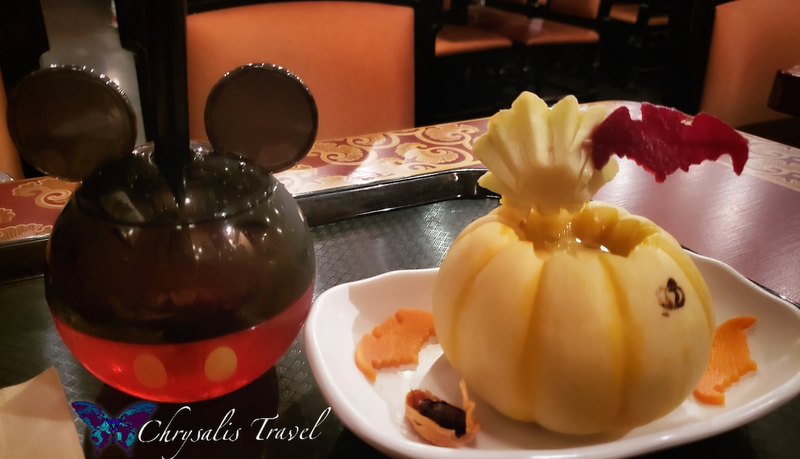 There were additional dim sum-style Halloween specialties that we didn’t get to at the Plaza Inn, and also at the Crystal Lotus restaurant at the Hong Kong Disneyland Hotel. 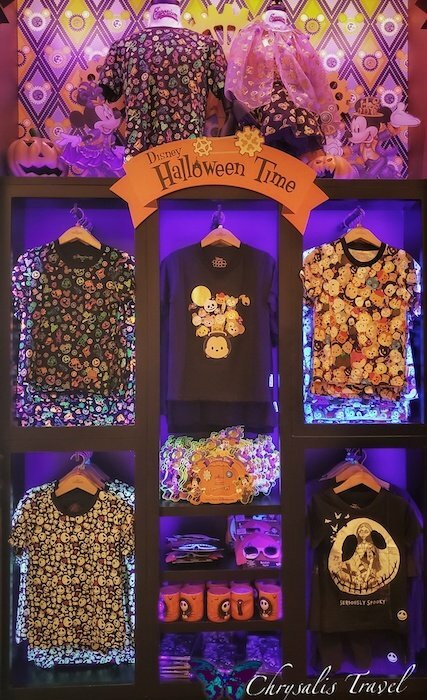 Seeing all the festive merchandise is an integral part of experiencing each season at the Disney Parks. 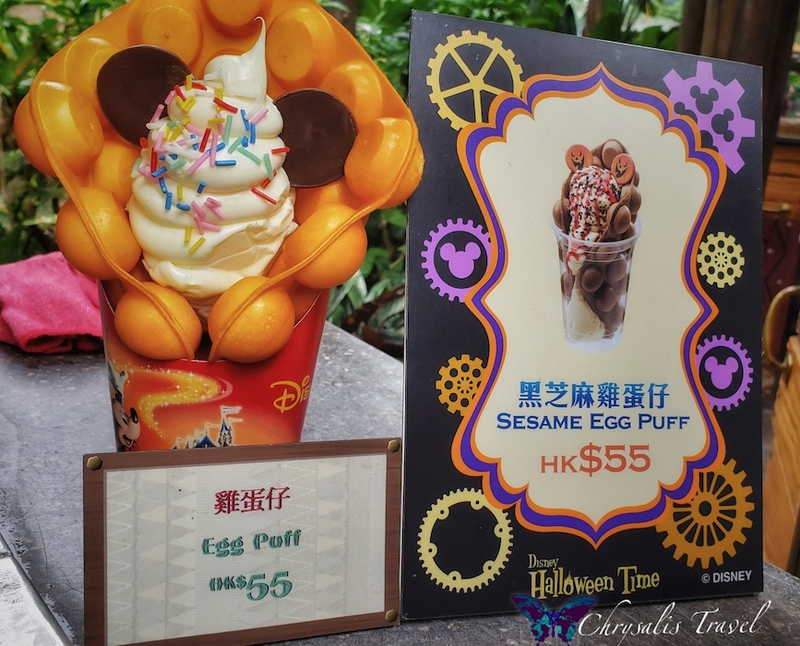 These “Halloween Time” products were exclusive to Hong Kong Disneyland. 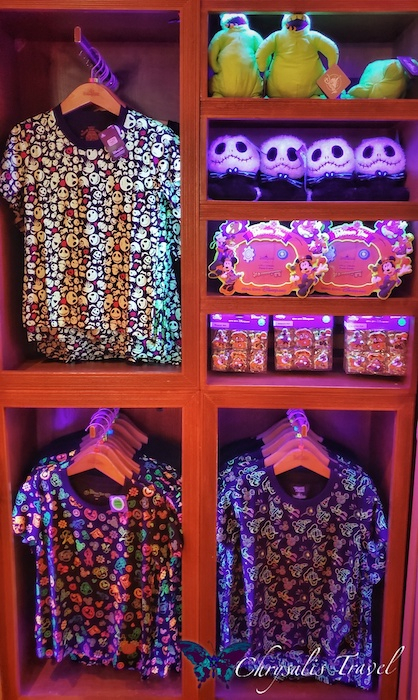 As were these glow-in-the-dark shirts in the Mystic Manor shop. 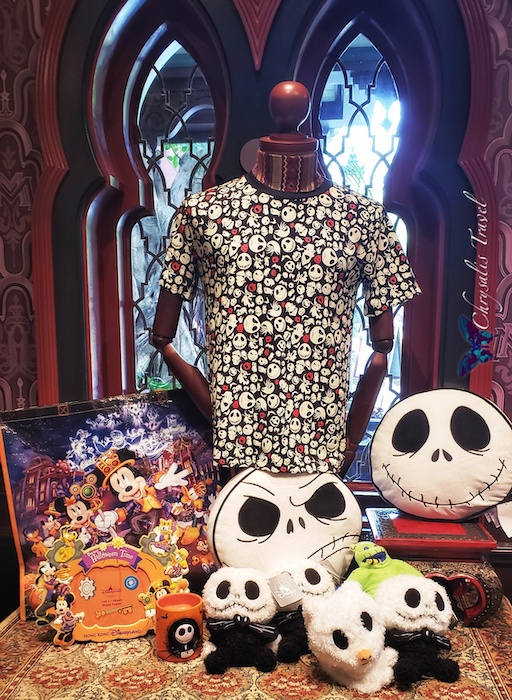 The Nightmare Before Christmas merchandise also featured prominently.